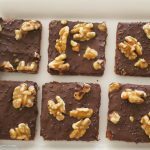 Nuttylicious walnut chocolate square cake bars – they are nutty and very chocolaty! I actually made them last week, on the International Chocolate Day observed on the 7th of July. Okay my post is a few days late but it’s never too late to celebrate chocolate!! On Facebook I asked about your favourite chocolate treats and the answers included brownies, chocolate with peanut butter and ice cream – yummy, yummy, yummy!! Everything is better with chocolate, isn’t it? I love to work with chocolate, incorporating it into batters and doughs, making ganaches, reshaping it and making pralines. You might have noticed that I tend to use dark chocolate in my recipes ( and occasionally white chocolate). If you aren’t a fan of dark chocolate and prefer a sweeter taste, you can always use milk chocolate instead. 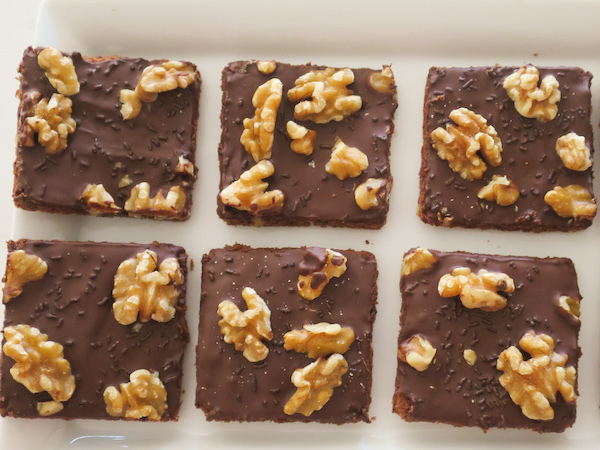 These walnut chocolate squares are cocoa walnut cake topped with semisweet dark chocolate, walnuts and chocolate sprinkes. 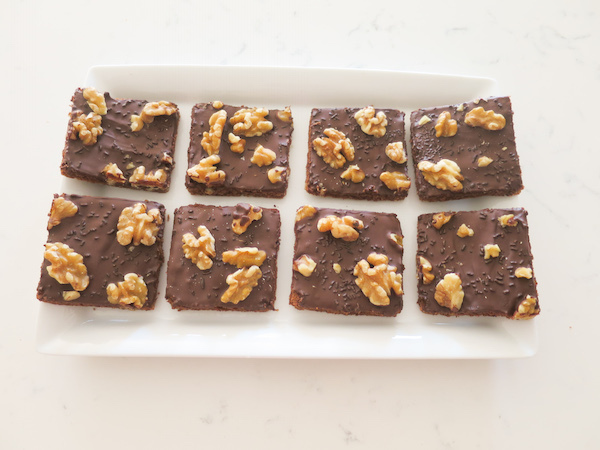 The chocolate dries faster when refrigerated and it gives it a nice crunch over a soft cake. 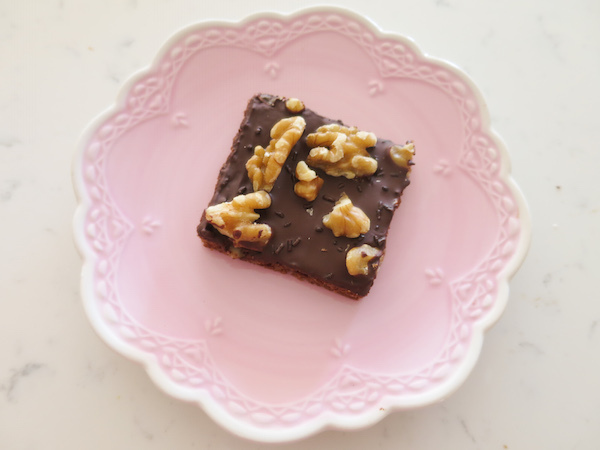 A square for dessert or with your afternoon coffee/tea is perfect sweet TREAT! 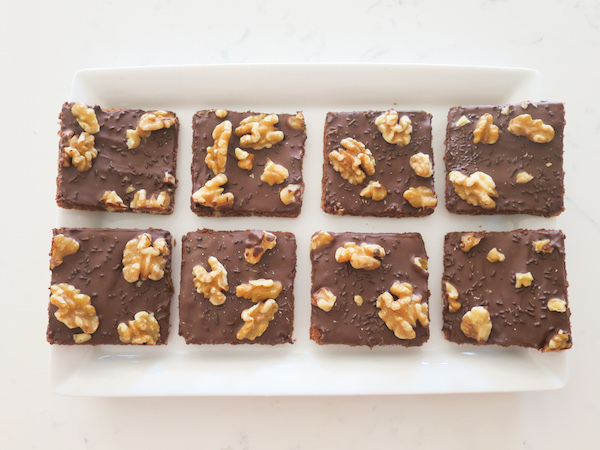 If you try this recipe, please let me know how they turn out and I’d love to hear about your version of these or other nutty chocolate bars! 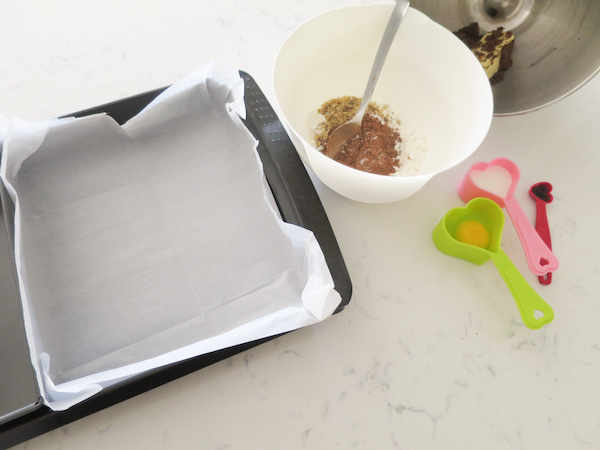 Preheat oven to 200ºC (356ºF) and line a 20cm (8inch) baking tray with parchment paper. In a mixing bowl beat butter and brown sugar until smooth. Add egg and continue beating on medium speed. In a separate bowl combine flour, ground walnuts, baking powder, cocoa powder and salt. In a glass or jar combine milk and vanilla. Add flour mixture and milk into the mixing bowl and continue beating until incorporated. 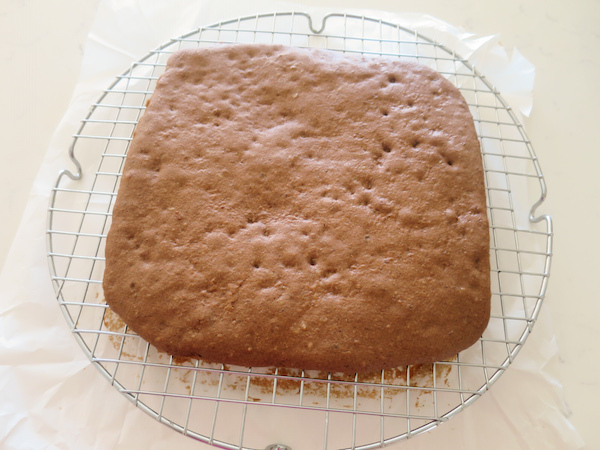 Pour into the prepared baking tray and spread by using a spoon or spatula. Carefully lift the cake onto a wire rack and melt the chocolate in double boiler or in microwave in short intervals. 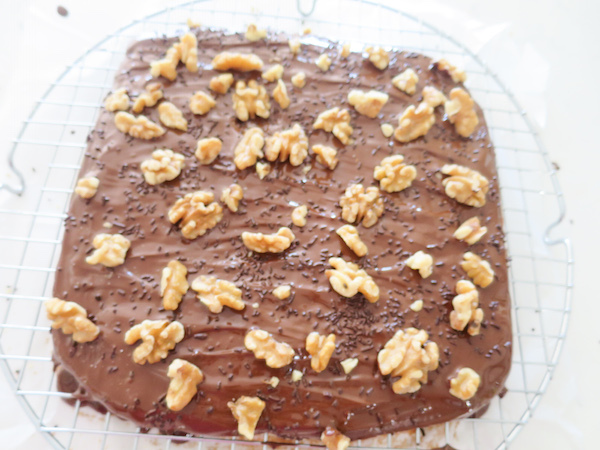 When the chocolate is melted into smooth and shiny consistency, pour it over the cake and sprinkle walnuts and chocolate sprinkles on top. 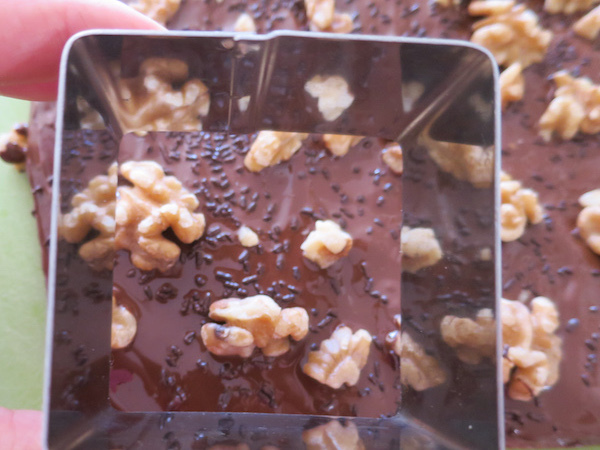 Cut into squares by using a knife or a square shaped cutter. Serve in room temperature or chilled.